My trials with gastrointestinal bleeds continue. Simply go straight up and click Primary Biliary Cirrhosis or Portal Hypertension Bleeds if you are a late arrival to this wearisome party. At this point I think I keep chronicling them so I can remember myself, have I had 11 bleeds or 12? How many transfusions so far? I was trundling down the tracks uneventfully — how lovely an uneventful life can sometimes be — when I derailed on October 28, 2014. I started with melena, and so my husband drove me to the ER; I knew from the metallic taste in my mouth the upper GI bit would begin soon. As one friend said, some people will do anything to win the Halloween costume contest. Now every bleed has its moments, and this was during the Ebola scare. I thought I could perform a useful service to the Ebola response team every US hospital was throwing together last fall, so I told the triage nurse that within minutes, probably no more than an hour, I would be throwing up blood. She stopped me. Had I been to Africa or been around anyone who had? No and no. However, I continued, since I posed no infectious risk, I was the ideal test: get a team suited up, handle me as though my emesis had an unknown cause, and see how well they did with avoiding getting any bloody vomit on exposed skin. She scurried away and passed me to a different waiting room for labs. The tech just about had time to get the needle in when up came the red blood, a good bowl full (I had brought my own bowl). We were crammed in a tiny room where another nurse was charting. The two looked horrified. I said, I told triage this would happen. On a scale of 1 to 5, with 5 being worst yet (the first, early August 2010), this bleed ranked about a 2, and only because it was both a melena and emesis event. I didn’t need transfusing. 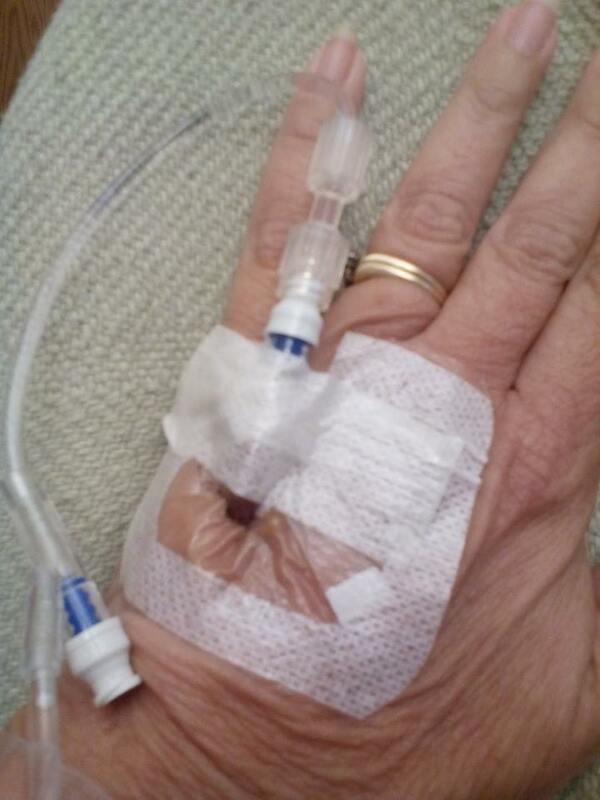 The Injectafer iron infusions I had had back in April stood me well. But then I made a mistake. After each upper GI bleed, the GI on call for the practice that has a monopoly in this town does an endoscopy to ostensibly find the source of the bleed. Since these scopes occur on average 18 – 22 hours after the bleed, and since in the meantime I have received bags of IV octreotide that stop GI bleeding, these are really Cover Their Asses exercises so they don’t discharge me with an active bleed. They have never once found the source of the bleed. Once you stop a bleed in the GI tract and it has had time to clot, chances of finding it are too small to bother with. Back to the mistake, and the second memorable moment. The GI visited my room and said, while he didn’t think he had found the source of this bleed, he did find some oddity. “I stared at it for a long time.” This was what he had to say about the oddity he decided to call an ulcer and to put a clip on (another scar!) even though he said it was in an odd place, wasn’t bleeding, and wasn’t the color or shape expected. But to answer my questions he repeated, “as I said, I stared at it for a long time.” (How very reassuring!) He wanted to stare at it again in 3 months. And like a fool, like an idiot, I foolishly, idiotically agreed to return February 3, 2015, so he could stare at it again. So in I go as an outpatient, in fine fettle. Hg on January 21 of 13.1. Very respectable. And the mysterious it? Vanished. The doc found the usual Cameron’s Erosions. I had a look at the pictures from his scope, and said, well, guess I’ll be back here soon. He said, on the contrary, all looked fine, no banding needed. February 12, 2015. Bleed the Twelfth. Nine days after the unremarkable exploratory I was in the ER again. This was a major bleed. On my new, devising as I go along, scale of 1-5, I’d say maybe a 4.0 to 4.5 based on projectile emesis and brief loss of consciousness. I still haven’t seen the stair stretcher or whatever it is the EMTs use (when I’ve needed it, I’ve been too far gone to see it). My biggest fans will know two things seem familiar here. One is the date. A year ago, Feb. 12, 2014, I had had a bleed on the first anniversary of my collie’s death. Now it was the second anniversary. Rascal bled out, by the way. Undiagnosed tumors burst on his spleen. Well, that is just coincidental gothic bad luck. But I’m not so sure about the other coincidence. The last time I had an exploratory scope in this city, I had a bleed about 64 hours later. That’s it. All done. I will have exploratories at University of Alabama-Birmingham (med school) Kirklin Clinic, but not here. And I may refuse any post-bleed scopes here as well. But that is a story not yet completed. For now let’s leave it at this: February 3, 2015, as an outpatient in good heath I had Managed Anesthesia Care (meaning a nurse anesthetist is present throughout the procedure). 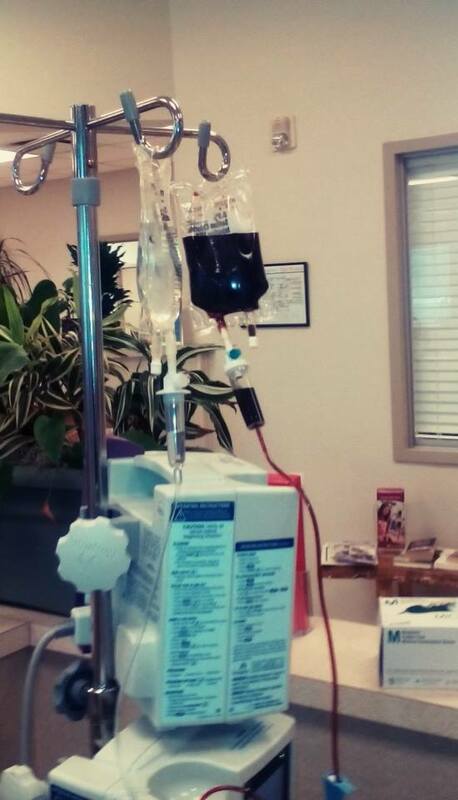 On February 13, 2015, as an in-patient who had lost an estimated 3 – 4 units of blood less than 24 hours previously, I did not. I left the hospital after Bleed 12 with a hg of 9.1. I had not been transfused. Two weeks later my hg had dropped to 8.7, and so I had my iron reserves checked: My iron was at 28, % saturation 6, and ferritin 4. So the hematologist this time ordered two sets of Injectafer (4 infusions). I should feel better by April 10. At least I am now caught up on chronicling my crises. This post updates my last one, Primary Biliary Cirrhosis, Portal Hypertension, and the Frustration of Knowing There’s No Way of Knowing What I Need to Know, in which I discussed what a relief it was going to be to have an exploratory endoscopy in which either I would discover that I had no varices on the verge of bursting and causing a life-threatening bleed, or if I did have varices, they would be banded and so I would not be at risk — for the time being — of a bleed. Tuesday morning: endoscopy. Great news! No varices! The GI suggested that maybe I could go a year before the next scope. Wednesday: Normal life, until evening, when it was a struggle to stay focused enough to watch the debates. Thursday: I felt really poorly, headache, no energy, unable to focus or think or read, light-headedness. I thought, Gee, it’s a good thing I had the endoscopy Tuesday or else I’d be sure I was starting a bleed. Friday, 1 am: Urgent need to use the toilet. Expelled globs of old digested black blood, then started throwing up black blood. Simultaneously. Really disgusting. Yelled for help, husband came, call into 911, off I go in the ambulance. Now, this bleed wasn’t as bad as bleeds one, two, and three because my blood pressure never dropped low enough so that I lost consciousness. I was even able to talk the EMT out of starting an IV in my rolling, uncooperative veins en route to the hospital along winding and bumpy roads. So what happened? How did I manage to go from A+ to F in the esophageal health department? Next day the founder and boss of the GI practice did a much slower endoscopy. He found a tear in the esophagus and repaired it with two clips. He wants to call it a Mallory-Weiss tear, which can follow extreme retching. But the only retching I did was sudden and swift vomiting of blood. In fact, no retching was involved. More like spouting. He can call it what he wants. There’s no way of ever knowing what caused this tear. But the hospitalist, the nurses, anyone without a vested interest in it being a Mallory-Weiss, is likely to agree with me: I got nicked during the Tuesday morning endoscopy. the diversity of clinical symptoms and signs combined with a lack of individual experience [among doctors] regarding this particular condition may impede rapid identification of this potentially hazardous situation. Accordingly, delayed diagnostic work-up may hinder timely and appropriate treatment with a negative effect on patient outcome. Well, that’s not real encouraging, is it? So now what? What do I do in six months’ time? It is, you see, a classic damned if you do and damned if you don’t, between a rock and a hard place, etc. situation: in trying to eliminate the risk of a burst varices bleed by exploratory endoscopy, I incur the risk of a bleed from the endoscopy itself. Well, I’ll tell you. I’ll have the scope. But I’ll either have it with the hepatologist at UAB even though that means a five or six hour trip, or maybe I would have it here — but only if the bossman himself does it. Someone who can do the math can combine these odds, just for fun. Incidence of having PBC in the first place: 2.7/100,00. Incidence of tears in upper endoscopies: 3-5/10,000. Incidence of having PBC and having a tear following an endoscopy = ?? ?